– Damage to the digestive system. The obese dog is suffering from slow transit, constipation, flatulence.The detoxifying function of the liver is reduced. – A general weakening: increased susceptibility to viral infections, anesthetics during surgery, reduced life expectancy. Before the dog treat obesity, it is first necessary to achieve a complete clinical examination, with blood and biochemical assessments appropriate to eliminate any medical cause. – A dog can not lose weight, that is to say, to be fed less, if the owner is not firmly convinced of the merits of the weight loss, and so much more than the “treatment” is long that the animal is hungry, he is accustomed to a particular frequency and volume to your meals. The stresses on the part of the animal will be many and the master should not “give”. – Weight loss will be slow (at least 2 or 3 months). – Adipose tissue is a high energy potential when in use (7000 kcal per kg fat). – A low calorie diet results in decreased thyroid activity and a significant decrease in basal metabolism. – A low-carb diet and / or high protein decreases the synthesis of brain serotonin, calming of appetite due to decreased blood levels of tryptophan. Full cooperation is required of the masters, and throughout the treatment. They must be confident and motivated. The idea is, first, to cover not more than 60% of maintenance requirements of the dog if he had an ideal weight, and secondly, to divide the rations into two or three meals a day, both to reduce appetite unsatisfied, and to prevent postprandial hyperinsulinemia, which promotes saving energy. The ration is best suited for will therefore consist of one quarter lean meat, for another quarter of lean cottage cheese, and the remaining half of carrots and green vegetables, plus a supplement of essential fatty acids, minerals and vitamins, rate of 4% of body weight of the dog.Wamiz Tip: Your dog needs to lose weight? 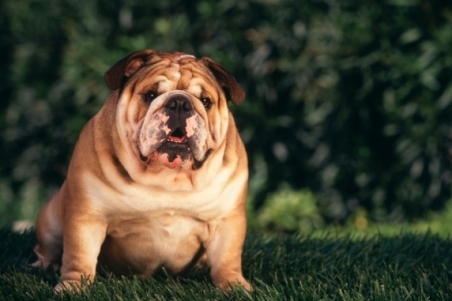 Discover our range of foods for obese dog. Should we draw a line under the treats? A U.S. study reported that among dog owners, 86% of them shared snacks with their pet, and 64% even shared their meals with their pets. Some people have a psychological tendency to share food with others or with their pets.These owners are hopelessly habituated to spoil their pets, must be taken into account in the weight loss program. The nature, volume and the total amount of food rewards and treats should be accurately assessed. According to the dietary restrictions that are needed, we must resort to unusual delicacies, it is surprising that many dogs like carrots, celery, lettuce or even popcorn! Exercise can afford to spend the extra calories provided by the treats. Food rewards can also be distributed after exercise or a special effort. If possible, part of the normal ration of the animal can be used for this purpose, but if the rewards are not superimposed, they must not compromise the nutritional balance of the plan or increase caloric intake. A reward can be very small, about the size of a raisin, and it is not necessary to provide each time the animal responds correctly. In fact, a dog will perform intermittently encouraged by longer and more intensely than an animal continually encouraged. When the animal has acquired the desired behaviors, social reinforcements are usually sufficient to maintain them.